The Spring Novice Thursday season will play at St. Peter's Church on Hanover Ave. in Allentown starting March 14th. Games will play on Thursdays, and game times will be start at 6:30pm. The bar sponsor for the season is TBA. 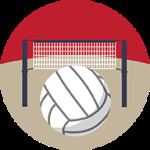 Check out this Volleyball (Indoor) league '19SPR - VOLLEYBALL - INDOOR NOVICE COED (RATIO 3:3) - ST. PETER'S CHURCH (THURSDAYS)' with Lehigh Valley Leagues!